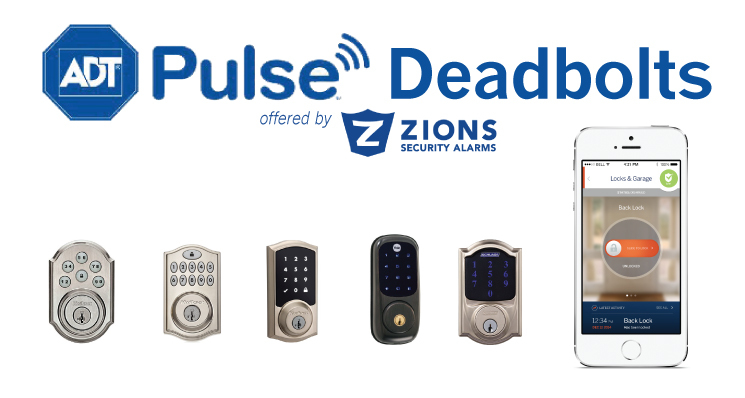 If you are in the market for an ADT Pulse Deadbolt or Door Lock you should know of the different kinds available and the pros and cons of each. Here we will showcase each one and tell you which ones we recommend. ADT Pulse Kwikset Deadbolt with 6 Buttons – (Back measures approx 7.5″ x 3.25″) This is the least expensive deadbolt to get for your ADT Pulse system. It is also pretty loud. If you do not mind a loud opening and closing sound it might be for you. It also has a large plastic back. If you have a full light door the border around the glass might get in the way of you being able to install this normally. Because the back can be lifted off so easily it is also the least secure of all the deadbolts since anyone can gain access to the programming buttons. I do not believe any of the Kwikset models come with 4 AA batteries. ADT Pulse Kwikset 11 Button Deadbolt – (Back measures approx 5.5″ x 2.625″)This is quietest of the Kwikset deadbolts and it has nice small back that is made of metal not plastic. It corrects most of the issues people had with the 6 button deadbolt. It has 11 buttons so the codes can be more specific. It also has a screw to hold the back metal plate on so others cannot remove it to tamper with the deadbolt. Some think it is too quiet because they cannot hear the door lock from across the house, but they can always check their ADT Pulse Keypad or App also. ADT Pulse Kwikset Touchscreen – (Back measures approx 5.5″ x 2.625″) This is Kwiksets newest and nicest deadbolt. They increase the sound a little from the 11 button model because some thought it was too quiet. The back is the same size as the 11 button. Requires allen wrench to open instead of normal phillips screws. Yale ADT Pulse Touchscreen Deadbolt – (Back measures approx 6.5″ x 3″)This is the quietest deadbolt and very nice quality. You have to enter programming to add codes where the Kwikset locks have a button to add codes. I think this deadbolt looks the nicest out of the all the options. Comes with batteries. Schlage ADT Pulse Deadbolt – (Back measures approx 8″ x 3″) Built well, very sturdy, most secure. It is a little noisy kinda like the 6 button Kwikset deadbolt. Comes with batteries. Overall the Yale lock is my favorite. It is almost the smallest. It is the quietest, and it looks the nicest in my opinion. It is a tough choice because every lock has something it is better at than others. So really it all depends on what features are the most important to you. Please contact us and tell us which one you like the most and why.